This article is a short summary of Pokkén Tournament DX. Pokkén Tournament DX is an enhanced Nintendo Switch port of the arcade and Wii U fighting game Pokkén Tournament, released in September 2017. Pokémon Battles that anyone can enjoy! The popular Pokémon fighting game comes to the Nintendo Switch™ console with added Pokémon fighters and new ways to battle other players. Take direct control of one of over 20 prized Pokémon fighters to defeat other Pokémon in action-packed arena fights. With Nintendo Switch, you can battle at home or on the go to become the Ferrum League champion! Master the new fighting styles of Croagunk, Scizor, Empoleon, Darkrai, and the newly added Decidueye. New modes give you the ability to challenge your friends in intense competition. Duke it out with your favorite Pokémon Fighters in Team Battle. Then record and upload your favorite fights with the new replay feature. Take the battle on the road with the portable Nintendo Switch system or find competition online in the new Group Match Mode. Do you have what it takes to claim the title of Pokkén Tournament DX champion? There’s only one way to find out, and that’s by stepping into the battle arena! 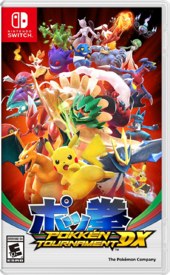 In addition to the main cast of the original game, Pokkén Tournament DX also includes playable characters previously exclusive to the arcade release, as well as a new exclusive character. Players can now play in 3-vs-3 team battles. New online modes include Ranked Matches in which players fight to increase their rank, and Friend and Group Matches exclusively between friends. 120,000 copies of Pokkén Tournamnet DX were shipped on launch week. Out of this, the game sold 53,395 copies, less than the first week sales of the Wii U version of Pokkén Tournament while still being the best-selling game that week. 1.0.1 September 21, 2017 Gameplay adjustments. 1.1.0 November 14, 2017 Adds online Team Battles, adds the ability to record movements in Free Training matches, adds Official Group Matches, allows players to change how battle records are displayed, adds Team Battles in Event Mode, character adjustments. Wave 1 (January 31, 2018): Adds Aegislash as a playable character, Mega Rayquaza and Mimikyu as Support Pokémon, new avatar items and outfits, and new titles. Wave 2 (March 23, 2018): Adds Blastoise as a playable character, Mew and Celebi as Support Pokémon, new avatar items and outfits, and new titles. ↑ Pokkén Tournament DX for Nintendo Switch. e3.nintendo.com. Retrieved June 13, 2017. ↑ 2.0 2.1 2.2 2.3 Pokémon Direct 6.6.2017. Nintendo (YouTube; June 6, 2017). Retrieved June 6, 2017. ↑ Weekend Update with Super Famicom manuals published online, Splatfest announced, Bokoblin plushie and more tidbits!. Japanese Nintendo (September 30, 2017). Retrieved September 30, 2017. ↑ 週間ソフト＆ハードセルスルーランキング（2017年9月18日～9月24 日）. Media Create. Retrieved September 30, 2017. ↑ Pokken Tournament DX sold through 41% of its initial shipment in Japan. Nintendo Everything (September 30, 2017). Retrieved September 30, 2017. ↑ トップページ｜『ポッ拳　POKKÉN TOURNAMENT DX』公式サイト. pokemon.co.jp. Retrieved June 6, 2017. ↑ Nintendo Direct Mini 1.11.2018. Nintendo (YouTube; January 11, 2018). Retrieved January 14, 2018. This page was last edited on 14 January 2018, at 17:56.